There is no company like SBI that provides an absolutely comprehensive set of materials for your home, especially when it comes to heating appliance solutions. This Flex Duct is no exception. SBI's 3" Dia. x 10' L (approximate) insulated flex duct provides all the flexibility and durability you need to complete your high quality SBI installation. Use this insulated flex duct as an integrated solution for your heating appliance needs, whether it be for home or business applications. What is the R value of this flex? This product will not list any R or K value. This product is manufactured for customers who are looking for a pre-insulated flexible aluminum liner when adding outside air to any wood stove that may call for 3" flexible aluminum ducting to be added to a 3" outside air connection. 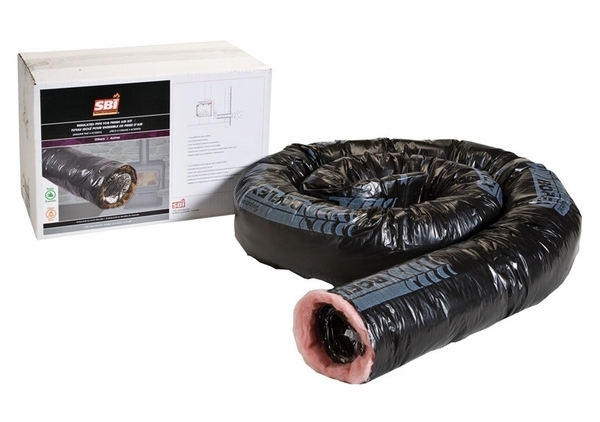 This product would be much more ideal when compared to non-insulated flexible liner, as it would keep the outside air cold and subsequently more oxygen-rich to create a more efficient burn while also eliminating the common annoyance of cold air radiating from exposed, uninsulated liner inside of a home.